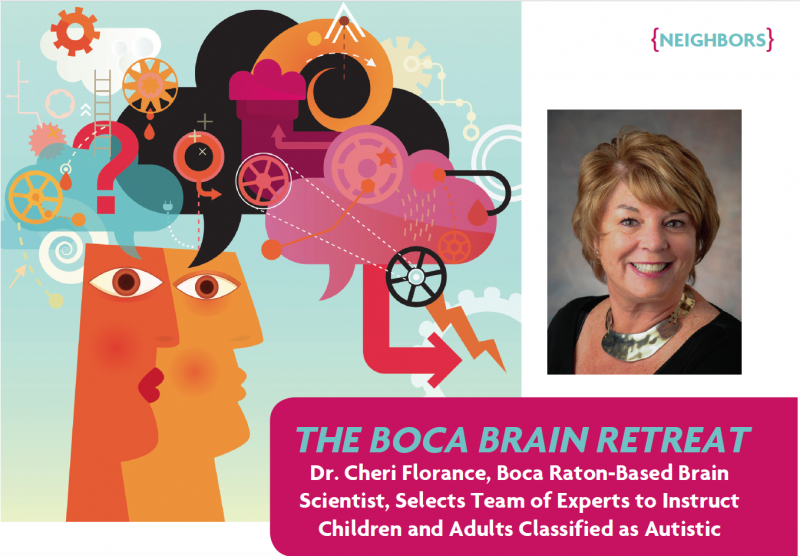 Cheri Florance, Ph.D. is a world renowned brain scientist trained at the National Institute of Health, best-selling author of The Maverick Mind, and founder of Brain Engineering Labs (www.cheriflorance.com) based in Boca Raton. Brain Engineering Labs was developed to unlock the potential, enhance the quality of life and sharpen the skills of children and adults diagnosed with symptoms of Autism Spectrum, ADD, PDD, and other disorders of communication, language, learning, and behavior. In March, 11-year-old Ben came to Boca with his mom from their home in Toronto, not only to visit his grandparents, but also to work with Dr. Florance and her team at the Boca Raton Resort and Club. Under her supervision and direction, her handpicked team of experts and professionals created an ideal environment to help with Ben’s training. Ben was diagnosed with autism in preschool. Ben is a highly visual thinker who scored in the superior range on a battery of tests that measure visual attention, visual memory, and visual processing. His highly visual parents — his mom is a veterinarian, his dad is a successful and visionary business executive — knew that autism was not the right diagnosis and went looking for alternative answers. After searching worldwide, Ben’s parents discovered Dr. Florance who agreed that Ben’s strong visual thinking was interfering with his ability to think verbally, and his overworking visual brain created symptoms that mimicked autism. Along with her team, Dr. Florance created simulators for Ben’s “brain transfer” so he can fully re-engineer his brain, step-bystep. ??? ?Ann Sapede, former Radio City Rockette dancer, taught Ben to listen to words, pull them out of the background music and imitate what he sees and the words he processes simultaneously. Lynn Stender, artist, taught Ben how to move his ideas from pictures in his brain to expressive art and then into words. Erik Silver, director of the tennis program at the Boca Hotel & Resort, worked with Ben to process quickly and accurately in a series of drills. Patricia Chevalier, a French teacher and native speak of French, created academic classroom listening, reading, writing, and speaking in a third language, after the visual thinking in English. In the past few months, Ben has shown remarkable improvements at school using his newly trained verbal brain; he has improved as an athletic and contributes creatively as a member of his family. His maternal grandparents and paternal grandmother are residents of Boca. The family is thrilled with his progress and anticipates even greater life fulfilling progress. Dr. Florance develops individualized training or “brain re-engineering” plans that teach attention, memory, listening, speaking, reading, and writing skills. The training begins with custom-built labs designed to stop the fighting between the visual and the verbal sides of the brain. “We want the verbal brain to work as a second language,” she explains. “The first language will always be the visual, non-verbal thinking. But a great second language can be developed for verbal attention, memory and processing.” To do so, verbal processing simulators are used for transfer of training. Over the past 16 years, Dr. Cheri Florance has studied over 1,000 Maverick Minds (visual thinkers), who come from highly visual families, and who have problems in verbal attention, memory, and processing. Mavericks are very frequently misdiagnosed as having an ASD — autism, Asperger’s, attention deficit disorder, pervasive developmental disorder or amotivational syndrome (in other words, “not trying hard enough”). According to Dr. Florance, a misdiagnosis of mental illness can lead to a chronic life-long disability, whereas a diagnosis of a communication disorder leads to the expectation that the skills that are lacking can be taught. Here is where the team of experts come in and plays a vital role in teaching clients how to think verbally. In addition to the information found on her website, www.cheriflorance.com, Dr. Florance sends free education brochures and materials to every family who contacts her. braindr@drcheriflorance.com or 866-865-9820. To view the magazine article in PDF, click here.